Moving to a new apartment can seem daunting. Packing, unpacking, cleaning- it’s exhausting! Here are some tips to make your move less stressful. 1. Start early- Don’t procrastinate! If you are moving in 30 days, do NOT wait until the week before you move to start packing. The sooner you start packing, the less you have to rush. You can take your time, and make sure things are packed well, and in an organized fashion. 2. Label, label, label! If you’re packing up an entire house, it’s possible to have over 100 boxes of “stuff”. Make sure you are packing like items with each other (for example, all canned food items together, and all towels together). As you pack, number each box and write a short description on the outside. Maintain a separate numbered log that gives greater details as to what’s in each packed box. That way, if a week before you move you realize you must find Aunt Nancy’s cookbook, a quick look at your list would reveal it’s in box #4. 3. Clean as you pack- As you pack each box, evaluate the necessity of the items. It’s better to get rid of unused items before the move rather than spend the time and energy moving them to a new home, only to throw them away or donate them soon after. 4. Make some money- This recommendation relates to tip #3. Weed out the items that you no longer need. 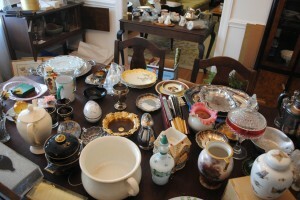 Plan a yard sale before you move, or list the unneeded items on a local yard sale site, or eBay. Make some extra money from your unwanted items to help finance your move! 5. Organize what needs to be done- Make a list of everything that needs to be accomplished, and when. For example, if you need to rent a truck to move, make sure you’ve rented it far enough in advance. Contact the postal service to request a change of address and mail forwarding. Having everything written down means you can physically check off the items as you do them. Moving can be a stressful event, but with these tips, you can reduce the stress and ensure it goes smoothly. In summer, finding something fun to do and FREE on the weekend for a family can be a challenge. Luckily for Twin Cities residents, Como Zoo and Conservatory is open and it offers a wide range of activities for the whole family. Whether you want to picnic, play mini-golf or visit the beautiful animals or stroll amongst the gorgeous flowers – it is all there in one place! Be sure to visit their website for visitor information! If you’re decorating your apartment on a budget, forget heading to high priced furniture and art stores. Instead, discover the amazing world of estate sales, garage sales, and thrift stores. Pick up a copy of the Friday paper and make a listing of estate, garage, and yard sales in your area. Visit these sales as early as possible on Saturday morning for the best selection. You’ll be amazed at what’s offered and how inexpensively it’s priced. If you see an item you’d like but can’t afford, check back towards the end of the sale. If it’s still there, the owners will most likely be ready to do a significant mark down. Check local thrift stores in your area for bargains on dishes, glassware, and kitchen supplies. You can usually find gently used items in beautiful condition at an excellent price. Think creatively a bit about how you can use common, inexpensive items to create functional art. Buy a set of inexpensive wine glasses and some tiny glass pebbles at your craft store. Fill the wine glasses half way with glass pebbles and use them to anchor a votive candle. You can also use sand or small beads to fill the wine glass. Need a cheap table? Place a clear, round piece of glass on top of a large, sturdy ceramic vase. Create a completely new piece of functional art by gluing interesting bowls to plates or gluing the bottoms of two bowl together to serve as the base for a centerpiece. The possibilities for transforming common objects into cheap art are endless. It’s easy to find quality picture frames cheap at yard sales and estate sales. Buy as many as you need to decorate your apartment. Find creative ways to fill those frames. Get out your camera and take your own nature photos or photos of local landmarks in your area. Buy old vintage books at the same estate sales and frame some of the more unusual prints. Enclose some beautiful fabric or handmade paper in a frame. Create your own artwork with paint and a little elbow grease. Budget artwork can instantly transform an apartment and make it look homey. As you can see lack of money doesn’t have to compromise your sense of style and good taste. Creative apartment decorating can liberate your creativity and your bank account.